This weekend, I was gifted with the pleasure of attending a screening of “Saving Mr. Banks” on the Walt Disney Studios lot with a Q&A session with Emma Thompson, Tom Hanks, Colin Farrell, Bradley Whitford and Jason Schwartzman. ….. Incredible! How was the movie? I loved it! Maybe I’m biased because of the circumstances in which I saw it for the first time, BUT…. I think it is a beautiful film. I laughed. I cried. And so did the whole audience. I won’t spoil it for you. Just go see it! Tom Hanks performed a 2 minute monologue, reenacting the phone call he got asking him to play Walt Disney (complete with “on hold” music). Colin Farrell joked about playing a drunk for the first time… on screen. Jason Schartzman gushed over what it was like to work with Richard Sherman learning to play the music for the film and then turning around and playing him. Emma Thompson shared how John Lee Hancock crafted this film to portray the truth that, good or bad, we carry our childhood with us. Tom Hanks praised John Lee Hancock for knowing precisely what the film needed, like each fold in a piece of origami. 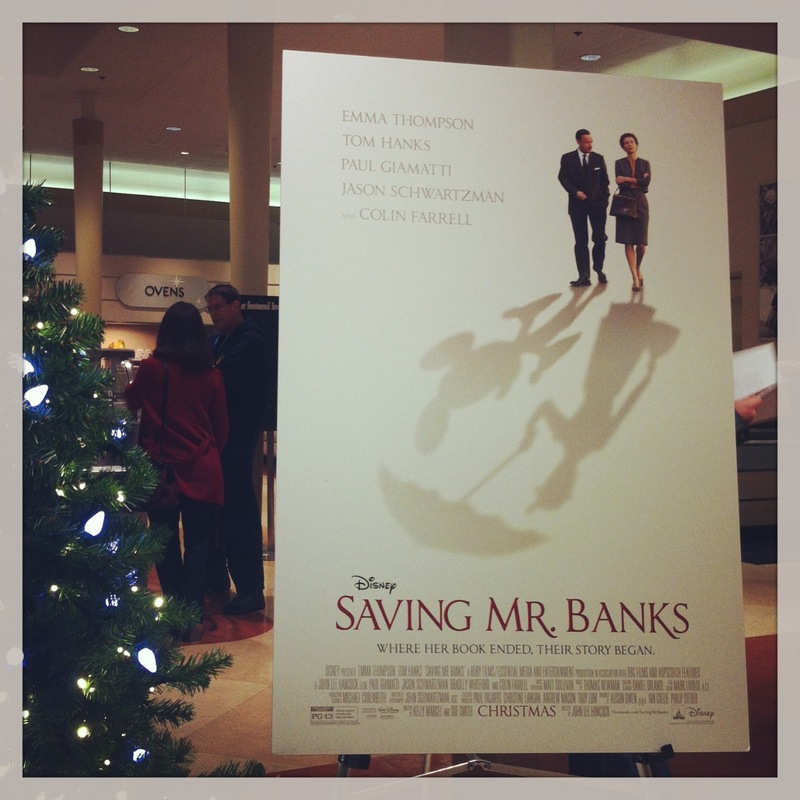 Jason Schartzman giddily revealed that he was able to see “Saving Mr. Banks” for the first time in the studio where the music for “Mary Poppins” was recorded. Colin Farrell brought it back to the basics: as actors we use every ounce of empathy we have to live truthfully as another human being. Emma Thompson’s greatest challenge playing this role? The perm! The reason we read books, go to movies, watch TV, talk with friends, is to engage in stories, however different or similar to our own, hoping to find something truthful in those reflections. This is why storytelling is powerful. This is why I keep creating, acting, and storytelling. This is why I studied theatre. This is why I see plays. This is why I moved to Hollywood. What a powerful reminder: This is why I keep going! I don’t know about you, but these inspiring moments don’t happen all that often. Maybe it isn’t that they don’t happen, but that sometimes I have to look harder to find them. Often I get bogged down in the days when nothing exciting is going on. We usually don’t advertise those days, do we? But on those days, I want to remember these moments that lift my spirits and make the impossible possible. When I stop to think… I’ve had more of those moments than I realize. What are your inspiring moments? Remember them. Keep them close.